Anthony Akumu and John Makwatta. Kenya’s Harambee Stars and Zesco United striker Jesse Jackson Were continues to electrify the Zambian Super League with his amazing scoring prowess. Now crowned “King Jesse” by Zesco’s loyal fans, the former Tusker FC talisman grabbed his 50th goal for the Ndola based heavyweights yesterday in a league outing. 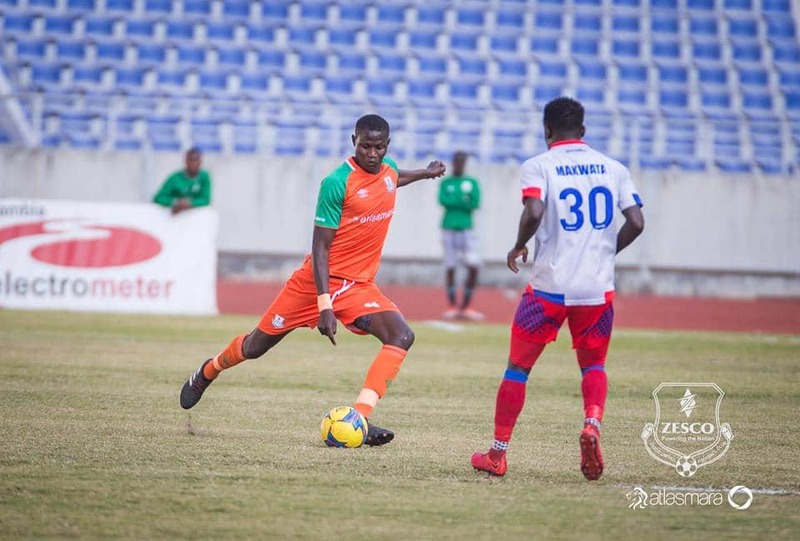 In the match against moneybags and neighbors Buildcon FC at Levy Mwanawasa Stadium, Ndola Wednesday, the 29-year-old opened scoring in the 58th with Raphael Kambole doubling the lead in the 85th minute for a comfortable 2-0 win. Since crossing over to the Southern African nation in 2016 January, Jesse has kept terrorizing defenses in the topflight mercilessly with his flash speed and stinging shots. He has thus far netted 11 times, two goals less than Nkana FC’s Congolese forward Idris Mbombo and one more than Buildcon’s Rahim Osumanu. He moves third on the list of Zesco’s all time marksmen after Jackson Mwanza and Winstone Kalengo. Jesse has constantly delivered double digits per season for the coach George “Chicken” Lwandamina’s side and was a cog in the team’s famous run in the 2016 African Champions League – reaching the semi-finals for the first time in their history as he emerged top scorer for club. Three more Kenyans were part of the Wednesday match; Anthony Akumu, who played as central defender for Zesco, defender David Owino, who started from the bench and John Makwatta, who played as a striker for Buildcon. Zambia has in the past few years been the destination of choice for Kenya’s top talents thanks to their competitive terms of work. The success of Owino, who was the first Kenyan to join Zesco in 2015 from Kenya’s Gor Mahia, opened doors for more Kenyans to make a decent living in the highly rated league. Jesse, who added two more years at Zesco last year, is currently one of the top valued talents in the Zambian league at $300,000.